After the vehicle involuntarily swerved from its lane. Due to the level of pollution emitted from the vehicle’s engine. If he wants to esure that the vehicle’s oil consumption corresponds to the vehicle manufacturer’s manual. If he wants to ensure that the vehicle’s fuel consumption corresponds to the vehicle manufacturer’s manual. When may a police officer revoke a driver’s license for a period of ninety days? When a driver involved in an accident is reasonably suspected of causing the death of a person. When the driver fails to give right of way. When is it permitted to drive on a pavement? It is permitted to drive on the sidewalk when one wants to cross it in order to enter/exit a yard or building. It is absolutely prohibited to drive on the sidewalk. It is permitted to drive on the sidewalk when it is free of pedestrians. What is the general excessive freight width permitted in a commercial vehicle with an all up weight of more than 15,000kg? Up to 2.60 meters, when the freight is in one unit. Up to 2.10 meters, when the freight is in one unit. Up to 2.50 meters, when the freight is in one unit. Up to 3.40 meters, when the freight is in one unit. Is it permitted to transport a freight container on a vehicle that is not equipped with twist locks? Yes, but only with a permit from the Licensing Authority. Yes, it is permitted to transport freight containers in every vehicle equipped with cables to safely attach the container to the vehicle. Yes, containers can be transported in every vehicle that has a high front wall. How is a driver required to drive near a group of children? Stop completely for as long as the children are near the road. Continue driving in normal speed, provided that the pavements are wide. Slow down, be prepared to stop and even stop if necessary..
Continue driving in normal speed, provided that he uses the horn to warn the children. A device which causes the braking system to operate each wheel independently. It is a device operated by the driver during continuous and steep descents. A device within the braking system that brakes each wheel independently when the vehicle is slipping. A spring loaded device that operates the braking system independently, and that starts operating when the air pressure in the braking system drops below its required level. Only the traffic court is entitled to revoke a driver’s license. Only a police officer is entitled to revoke a driver’s license and to require a driver to undergo examinations. The Licensing Authority is not authorized to revoke a driver’s license. The Licensing Authority is entitled to require a driver that incurred demerit points to undergo examinations, and it is also entitled to revoke his license. Is it permitted to park a vehicle on the left side of a two-way street? Yes, provided that it is parked close to the sidewalk. Yes - in a street with at least three lanes. Yes - in a street that is wider than 8 meters. Is it permitted to use any other means for signaling when the electric signaling system is not functioning? It is required to give signal by hand, but only in good weather conditions. It is required under these circumstances to give signal by hand. No. You must use the direction indicator for signaling. It is required to give signal by hand, but only at night. Under what terms is it permitted to transport hazardous materials? The transportation should be approved by the Ministry of Internal Security. The driver must have an adequate permit, and the vehicle must be new (less than four years). A vehicle transporting a hazardous material must have a gasoline engine only. The driver and the vehicle must have adequate permits to transport hazardous materials from the Licensing Authority. Who is under obligation to be familiar with the traffic laws and obey them? There is no distance restriction between the towing vehicle and the trailer. All motor vehicles, including trailers and semi-trailers, but excluding motorcycles. You are driving vehicle no. 3. In what order will vehicles enter the following intersection? 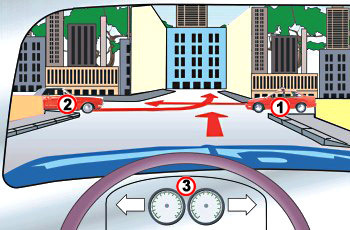 The vehicle on the left will go first (2), the vehicle on the right will go next (1), and you will go last (3). You go first (3), the vehicle on the left is next (2), and the vehicle on the right is last (1). The vehicle on the right (1), you go next (3), and the vehicle on the left is last (2). You go first (3), the vehicle on the right is next (1), and the vehicle on the left is last (2). Who is responsible for a vehicle parked in a prohibited area? The vehicle’s owner as listed in its registration document, regardless of who was driving the vehicle at the time the offense was committed. The vehicle’s owner as listed in its registration document, unless he can prove the identity of any other driver who committed the offense. Complaint would only be filed when it is made clear who was driving the vehicle at the time the offense was committed. The rental agency if the vehicle was rented from it. You are entitled to put on the emergency yellow indicators..
You are permitted to turn on the fog lights. 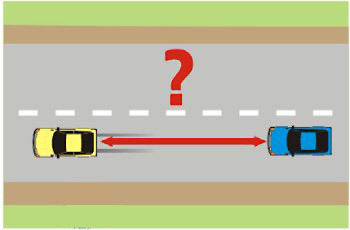 What should you do when driving on a narrow roadway and you are suddenly approached by a vehicle from the opposite direction? Honk and signal with your hands for the driver to return to his lane. Slow down and swerve as far to the right as possible, but don’t pull off the road. Slow down, move as far to the right as possible and, if necessary, pull off the road. Turn on your high beam and signal the other driver to return to his lane. What is a reasonable vehicle speed? On paved roads – 80KpH; on dirt roads – 40KpH. 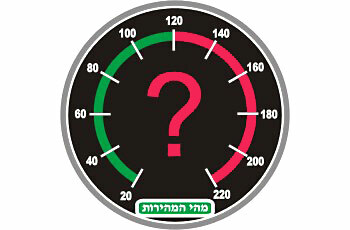 The maximum speed the vehicle can reach under the existing circumstances. Any speed, as long as the driver fully controls the vehicle. Can the details specified in the bill of lading serve as proof of the freight’s weight? Yes, the freight’s weight indication in the bill of lading serves as proof of the correct weight, within a margin of 20% above or below the indicated weight. No, the weight indicated in the bill of lading is not a final, solid and accepted fact. Yes, but only for freights in a maximum weight of 10,000 kg. What is the minimal gap that you should legally maintain from the vehicle in front of you? At least twenty two meters. The distance traveled in two seconds of driving. The distance traveled in one second of driving. Hold an extra pair of the optical instrument, besides the pair he’s wearing. Hold in the vehicle a spare pair of glasses or lenses apart from the pair he’s wearing. Verify before driving the regularity and cleanliness of the optical instrument. Perform a visual acuity test once every six months, according to requirements. To which of the following should you give right-of-way when making a left turn in an intersection where no road sign is placed? To a vehicle coming from the left only. To a vehicle coming from in front of you only. To a vehicle coming from the front and from the right. A new fixture that is designed to elevate the axle while changing a punctured tire. A fixture in the vehicle that prevent the vehicle from rolling-over during loading or unloading of an interchangeable box. A fixture that is permanently installed in the vehicle and designed to lift or lower interchangeable crates..
A fixture that is permanently connected to the vehicle and designed to lift one side of a side-loading-platform. How would we mark a commercial vehicle with an all up weight of more than 3,500 kg that transports at least 11 passengers? This commercial vehicle doesn’t require any special signing. By placing a “passengers” sign in the front only. 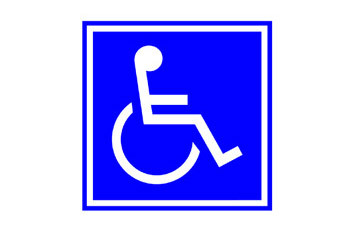 By placing a “passengers” sign in the front and back. With a “careful, children” sign. What is a driver of a vehicle carrying oversize freight required to do when due to road conditions he cannot be overtaken by other drivers? Drive until the nearest parking bay or bus station bay and stop to allow other vehicles to overtake him. Turn on the four distress winkers, and continue driving on the right of the road way. Swerve his vehicle as far to the right of the roadway as possible, but avoid pulling into the “hard shoulder” because the vehicle’s weight might cause the “shoulder” to collapse. Slow down and, if necessary, pull into the “hard shoulder” and even stop, to allow the vehicles behind him to overtake safely. What is the maximum speed permitted for work vehicles and commercial vehicles with an all up weight that exceeds 12,000 kg? Same as any other vehicle on the roadway. You are driving vehicle no. 3. To which of the following vehicles would you give right-of-way? To none of them. You have right-of-way on the straight road (3). 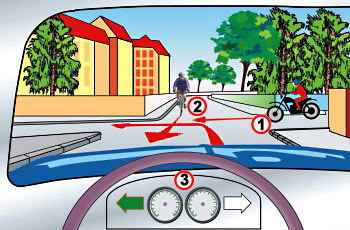 To the motorcyclist (1) and to the cyclist (2). To the cyclist only (2). To the motorcyclist only (1).